But even the perception of discomfort varies from person to person. A seasoned veteran testing out a bike is likely to have a different perception of discomfort on a given bike than a beginner may. Bicycle marketing literature as well as reviews of bikes usually are plentiful in these sort of subjective feelings that no one can put a number upon. X person tests the bike. He likes it. Finally, he places some arbitrary golden stars as rating against the bike in a magazine. What does the reader feel? You'd want to snap - "Who cares about small numbers, just believe it and ride it!". Yeah, that's alright. But as bicycles get more expensive and new inventions border on that which is ridiculous, when bold claims ask for a lot of money in exchange, a customer would surely not mind knowing if there's true value in these claims or if there's some sort of daylight robbery going on. Zertz - A marketed viscoelastic insert for reducing vibration. It comes standard on many of Specialized bicycles and cannot be removed or replaced. One of those claims involve the relation of bicycle design with vibration reduction. 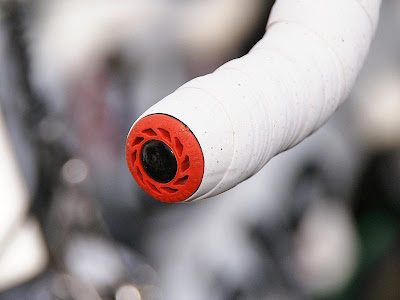 For example, some years back, we saw Specialized incorporating an elastomer insert into their bikes at specific locations that supposedly "soaked up" the road chatter. Others have marketed frames and forks with special, curvy shapes that implied they're somehow better at vibration reduction, power transfer etc etc. Note that there is zero published technical evidence backing up the claims, yet people are quick to side with one brand or the other because of personal feelings. This picture shows the harmonic tuned mass damper marketed by Bontrager as the Buzzkill Damper. This particular one was seen at times on Stuart O'Grady's bikes at the Paris-Roubaix. More on this can be found here. One of the recent examples is Museeuw's biocomposite bike, a medley of organic flax and carbon fiber made in Belgium through a patented process that I've written about in the past. Their marketing strategy seems to be to make people believe that there's something really magical about its vibration dampening characteristics compared to competitor's bikes. Interestingly, they have joined hands with the materials engineering department at the University of Ghent in a partnership to do the R&D work. Apparently, one of the deliverables from the University would be an objective study of the bike's vibration dampening characteristics so that they can be presented to customers with commercial interests. Recently, the 3D plot you see below was leaked out to the public on the internet after a Museeuw press launch. How it got leaked is a story you need not worry about. Anyway, the plot came directly out of one of the studies on the flax-carbon bike done by an individual named David Luyckx. Fig 1 : This plot shows Damping Percentage vs Vibration Frequency vs Time for a Museeuw MF5, measured using two accelerometers mounted on the bicycle. Vibration frequency is a function of mass of the vibrating body, here, the bicycle and rider. Little is known to us about the test equipment and instrument characteristics of the accelerometers used. Now in the automobile and motorcycle industry, there are some specific ISO standards you have to follow to measure dynamic comfort and whole body vibration while sitting in a vehicle. None, as far as I know, exist that describe what to do incase of a bicycle. So David Luyckx set out to design his own experiment. What To Measure : Ride comfort while using the flax-carbon bike, by studying trends in vibration dampening in the same (histeretic dampening). Specifically, the transmissibility of vibration would be measured. In other words, if there was a way to measure and determine the difference between the loads that were introduced into the frame and the loads that the rider would experience, it could be determined how "comfortable" a bicycle frame was quantitatively. Experimental Setup : From his limited test report, Dave told us that he mounted an accelerometer near the rear wheel hub which he believed would give him an idea of the loads coming into the frame. A second accelerometer positioned just below the saddle on the seatpost would get him a measure of the loads before the rider experiences them. The difference, according to him, is how much of the vibration pie the frame takes eats away. Methodology : All four frames - Museeuw MF5, Pinarello Prince, Wilier Cento Uno and Cervelo R3SL - were tested 4 times each with 2 clincher type rims (high and low profile) and 2 tubulars (high and low). If his idea was correct, by this method, he would not see too much difference between different wheelsets since he was only looking at only the frame properties between rearstay and saddle points. The measurements were done using independent accelerometers at a measuring rate of 50 Hz. The accelerometers were synchronized before the test. This enabled him to obtain a frequency spectrum of 0 to 25 Hz at any given time after putting the datasets through a Fast Fourier Transformation (FFT). He claimed this particular test method is comparable to how construction workers are monitored for whole-body-vibrations during their work. So, for every 27-second interval, the FFT-algorithm was used to get a 2D frequency spectrum, i.e. "frequency vs. load" graph. By using the 27- second interval he could avoid any response delay of the frame when impacted. By comparing each individual 27-second frequency spectrum of the rearstay and seatpost at the same interval, he was able to construct the 3D graphs shown above which involved approximately 300 graphs put next to each other. Results : Final results showed a margin of difference of vibration dampening less than 5%. Interpretation Of Graph : A value of "0.8%" on the y-axis in Figs 1 and 2, according to Dave, signifies that 80 percent of the original load is being absorbed or dampened somewhere between rearstay and seatpost. So he claims that the MF-5 dampens around 70 percent of the original load whereas the Pinarello Prince in Fig 2 absorbs only 45 percent of the original load measured at the rearstay of its frame. 1. Amount of monitoring and placement of accelerometers - Can bicycle vibration really be fully captured by just two accelerometers on the bike? And how does their specific placement and mounting affect the frequency spectrum? 2. Cushy tires and a saddle - If you let some air loose from your tires, what's the effect on vibration dampening? Tires have significant roles to play in this aspect. It is well known that racers in the grueling Paris-Roubaix lower their tire pressures to about 80-85 psi to ride on cobbles. They even bend their elbows and loosen their grips on the handlebars to a significant extent. Also, if you have a cushy seat, the force on a rider might be tiny yet the accelerations on the seatpost may be large. 3. Varying frame geometries and designs - All 4 bikes tested have different geometries and aesthetic features. What effect do that have on vibration transmission or dampening? Can you say for certain that a curvy chainstay has zero measurable effect? 4. Frame flexing - A frame design is, to some degree, known to have comfortable ride characteristics if some level of compliancy is incorporated into the design. This means that the frame can flex finitely in a particular direction to reduce shock transmission and then transfer back the potential energy by acting sort of like a spring. If the flax frame reduces vibration by flexing, this can involve high forces. So one could theoretically make a noodly little frame which is poor in power transmission but perhaps great at shock absorption. So the above study does not establish conclusively whether the claimed vibration dampening in the flax-carbon frame is infact from the vibration soaking capabilities of the flax-carbon material or because of the flexing of the frame due to the mechanical properties of the overall structure. Let's put this above table into perspective. Early this year, the same independent magazine tested 27 top end carbon fiber bikes that you can buy for money. From the published test results, I calculated that the average torsional stiffness for those 27 bikes was on the order of 95.85 Nm/degree, the average bottom bracket stiffness was 55.77 N/mm and the average lateral stiffness of the forks of these bikes was 43.81 N/mm. So compared to those averages, the flax MF5 bike appears to be 29% lower in torsional stiffness, 21% lower in bottom bracket stiffness and 10% lower in fork lateral stiffness. This isn't sensational in the market, especially for the price of the frameset alone, a whopping 5000 dollars. However, that's not the point. Suppose its these low numbers of stiffness that's providing all the "vibration soaking effects" in the flax frame? This can be a valid correlation, why not? Afterall, we all know that an overly stiff bike is not comfortable for long rides. I'm eager to know more from David's side of these investigations and how this develops for the future. However, it stands right now that what he's taken upon himself is a challenging scientific task. If the outcome of these studies are minute percentage differences of one bike over the others, then someone can easily lose sight and perspective of the scale of numbers. That must be kept in mind. Meanwhile, I would encourage him and others who're on the same boat to look at the automobile industry, especially that of motorcycles and also study ISO standards on how to go about setting up experiments and measuring whole body vibration while using a vehicle. If any of you are particularly interested in this topic, or is experienced in measuring vibration in your fields of work, please do write in to me with your thoughts here. Thanks for your post. I think this is one of the more important issues with bike design & marketing. Most reviewers are told what ride to expect prior to testing & have preconceived ideas of the ride characterists of different frame materials. So developing an unbiased repeatable testing protocol would be a huge leap forward. I'm not sure how manufacturers will react, as I guess not all 'special' design features will be proved to be functional. it's posts like this that make me feel smarter, eventhough i'm really not (well, maybe +/- 5% but that's negligible in the iso's eyes). keep it comin'! In every bicycle design, there are tradeoffs. Too much of one good attribute leads to the lessening of others. I think its upto the consumer to make the compromise. Ron their are a couple wild cards in the mix. That would be rider size, power, and weight. A bike that feels stiff to 140 lb rider may feel like a wet noodle to a rider that weighs 200 lbs. So the bike needs to be tuned to the individual rider. I think the future of frame building is custom composite frames for everyone. Here is how the process will work. "Just add money!" A female frame mold will be rapid protyped based on the riders custom specifications. A ceramic male mold is then created from the female mold using "Advanced Cermacis Manufactering's" Aquacore Premium Ceramic. Then the carbon composite frame will be layed up over the ceramic core and cured in an autoclave. Once the frame is cured the water soluable ceramic core is dissolved away leaving the pure carbon frame now ready for finishing. Rumor has it that Race Face is building its carbon cranks this way. I was wondering would there be any way for the designers to do a modal analysis using computers? The only challenge I see here is how to tell the computer that the bike has a special composite material in it? Hey Ron, sorry but I'm not one of the humans gifted with brain power. But what's this fast fourier transform? I hate to state the obvious, but all materials have natural damping in them or else they would continue to vibrate for ever. Superior damping characteristics was one of the selling points of magnesium frames when they first came out. Also check out Elastic hysteresis as I believe it explains the Bontrager phenomena.